My wife, Samantha (Sam) Yates, passed away in April 2013. 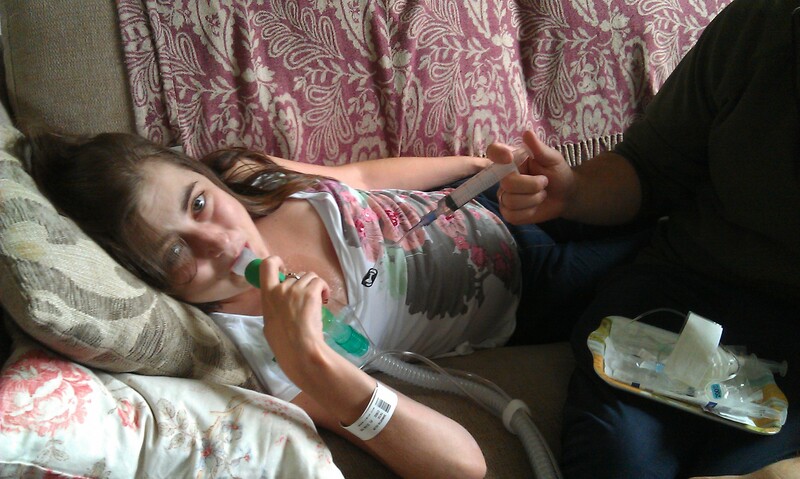 We lived in Hampshire together and waited in vain for a double lung transplant. I was diagnosed with Cystic Fibrosis (CF) when I was six months old. As a child I was in and out of hospital fairly frequently and would have regular two-weekly stints in hospital where I would receive intravenous antibiotics to fight infections. CF didn’t cause me too many problems during my school years, and I went on to university where I trained to be a teacher. Miraculously, I got through university without a single day off due to CF! I met some great people there who have been so supportive of me during this tough time. I met my husband, Luke, back in August 2002 and we have been married for nearly five years. I am so very grateful that there are people willing to make the selfless decision to sign the Organ Donation Register so that out of a terrible tragedy, something good may come of it. I was officially listed for transplant on 12th January 2010 and when the transplant co-ordinator from Harefield called me to inform me of this, it felt like I’d won the lottery, despite it only being the start of my transplant journey. Since being listed I have had two false alarms – both times the donor lungs were assessed as being unfit for transplantation. I still feel incredibly grateful to those selfless donor families who gave their consent for their loved one’s organs to be donated. Although my lung function and health haven’t dramatically deteriorated any further, as time goes on I can feel myself becoming weaker and weaker and feeling more and more dependent on my family and my treatment. My mum cares for me during the day – she comes down to my house at 8 am and helps me get off my NIV (which I now need to use each night) then assists with my morning routine. She comes down again in the afternoon to do my physiotherapy and Luke takes over when he gets home from work. To say that I feel like a burden is an understatement. It isn’t how I imagined living as a young married couple. I really miss my independence and the ability to be spontaneous and I cannot wait for the day that I am able to stand in front of a class and teach again! While I live daily waiting for my call to come I try to keep as active as possible and not dwell on my situation. This is very hard, if not impossible to do at times. I am so very grateful that there are people willing to make the selfless decision to sign the Organ Donation Register so that out of a terrible tragedy, something good may come of it. I am also in awe of the relatives of those people who, through their sorrow and heartbreak, give their consent for their loved one’s organs to be donated. After being listed for transplant, Sam courageously decided to share her story in the hope that it would lead to an increase in the number of people who sign up to the NHS Organ Donation Register. Sam wrote regularly about her life and experiences waiting on the transplant list in her popular blog ‘The end of my tether?’ but was also interviewed for local newspapers, radio and both regional and national news. Although Sam’s transplant never came, she tirelessly campaigned for an increase in the number of organ donors. Sam spent her final months trying desperately to encourage more people to sign up to the NHS Organ Donor Register so others would not face the agonising wait she endured. Sam advocated for organ donation, accepting that if she was willing to be an organ recipient, she must be willing to be a donor. In a final act of selflessness, she donated her corneas after she passed away. Through giving someone back their sight, Sam’s legacy lives on. Becoming an organ donor is simple, just visit the NHS donor register, fill in your details and make sure to tell your loved ones.